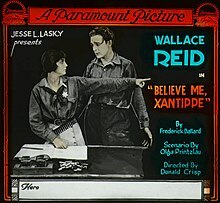 Believe Me, Xantippe is a lost 1918 American silent romantic comedy film produced by Jesse Lasky for release through Paramount Pictures. The film was directed by actor/director Donald Crisp and stars Wallace Reid and Ann Little. The film is based on a 1913 William A. Brady-produced play Believe Me Xantippe by John Frederick Ballard, which on the Broadway stage had starred John Barrymore. As described in a film magazine, George MacFarland (Reid) makes a bet with two of his friends that, having committed a forgery, he will be able to elude the officers of the law for one year. As his friends are very thorough, he does not find it an easy matter getting around town. He finally goes to a small town in the west where he lives unmolested for eleven months. On a hunting expedition he meets Dolly Kamman (Little), daughter of Sheriff Kamman (Beery), who takes George to meet her father. As Dolly has fallen in love with George's photograph, he is a somewhat privileged prisoner. On the day the bet is off George hears that his friends have drowned and he is sure he is to be sent to Sing Sing. The arrival of the boys, however, changes things, and in addition to being set free George wins Dolly. ^ The American Film Institute Catalog of Motion Pictures Produced in the United States: Feature Films, 1921-1930. 1971. p. 432. ^ Fleming, E. J. Wallace Reid. McFarland. pp. 120–121. ISBN 0-786-48266-4. ^ "Reviews: Believe Me, Xantippe". Exhibitors Herald. New York City: Exhibitors Herald Company. 6 (24): 28. June 8, 1918. This page was last edited on 5 May 2018, at 04:27 (UTC).